If you are a bird watcher, you know that birds love to eat! Every day I delight in watching my hummingbird family enjoying their hourly quest for food. The male is very brave and has been know to fly right up to me as I patiently wait for the right photo op! Soon, the female joined him on the quest for their meals. Not long after, a third, then fourth hummingbird appeared, entertaining me with their cavorting and competition for the feeder. Sadly, last May, I found two dead, featherless babies who had fallen from the nest. My theory is that the second set of birds are new babies, now juveniles. These photos are included in the WordPress Weekly Photo Challenge Quest. This was recently updated to be included for the WordPress Discover Challenge Animal. Feel free to join these challenges any time! 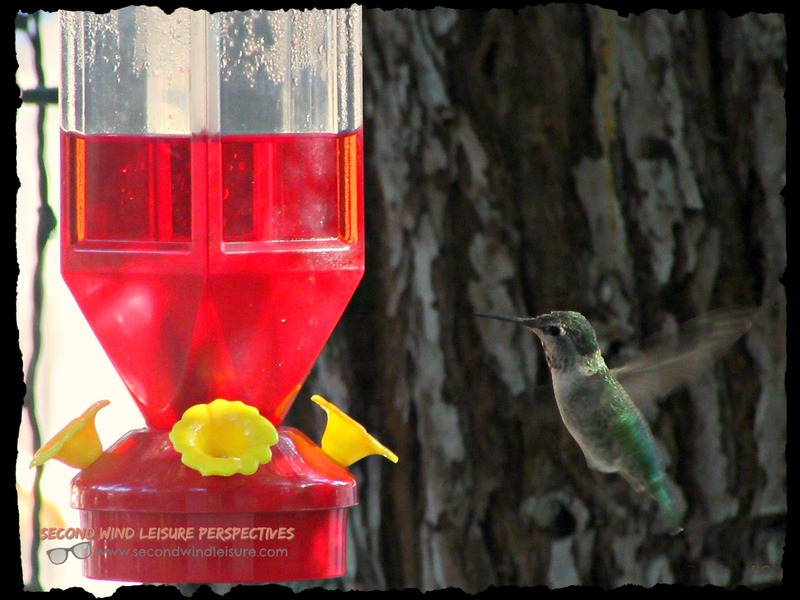 Hummingbirds will tap on our glass door when the feeder is empty to let us know. Wow! Now those are demanding birds! Love your pictures. 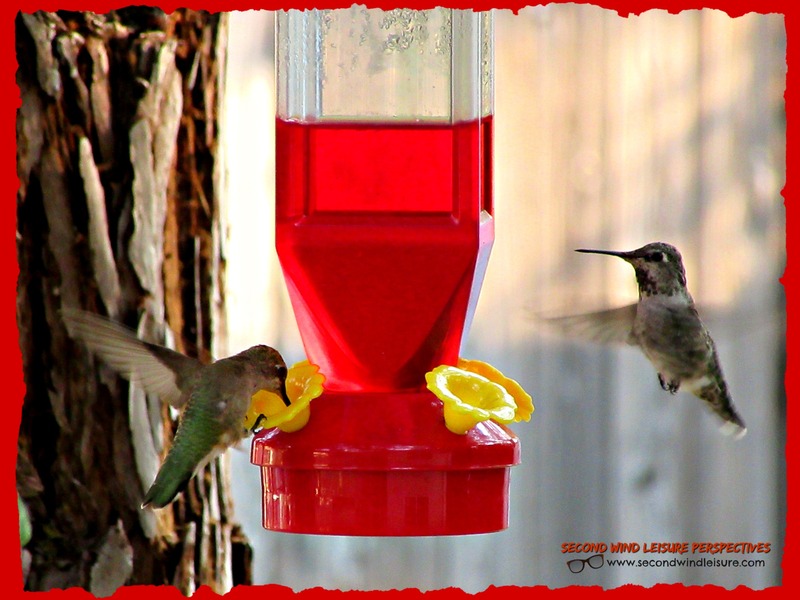 The bright red feeder really makes the pictures pop. I use to participate in the WordPress Friday Photo challenge and loved doing it. You have inspired me to get back into it. Thanks for sharing. Hummers can get very insistent. I love watching the hummingbirds :), Mix them up my own special blend of Hoosier Hooch even :). May I ask , what is the best solution to make them? I just buy the feeder concentrate, any home store or grocery store has the mix. Recently we had a cold spell and I didn’t see any hummingbirds so I figured they had all flown south. I brought in my feeders and a little later I was looking out the window and a female hummingbird was looking for the feeders. She looked so disappointed! It broke my heart so I hurriedly made some more nectar and hung one of them back out. She came back to enjoy it! I love watching the hummingbirds. Pretty birds! I’m looking forward to seeing ‘my hummingbirds’ when we visit Arizona this winter. They are such colorful little characters! I hope you get to! They ARE characters!